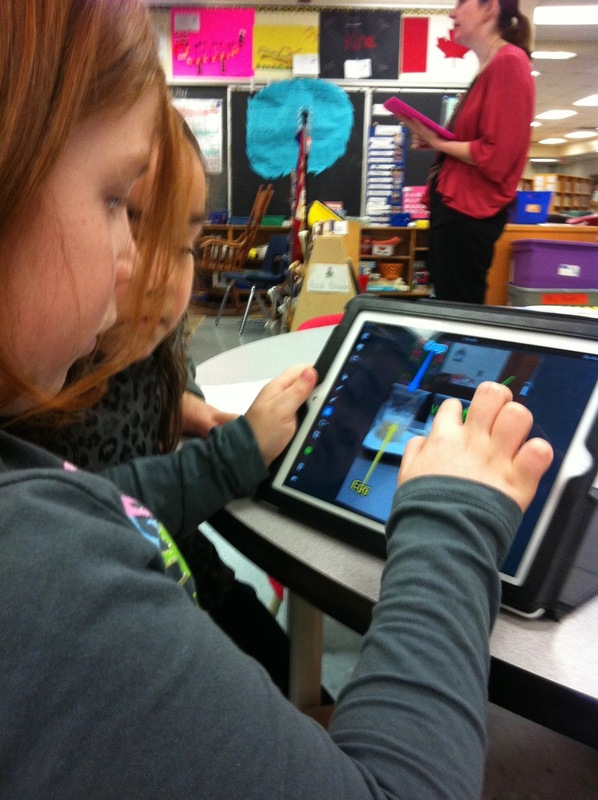 I have been in many classrooms since October that are fairly new to using iPads in their classrooms. 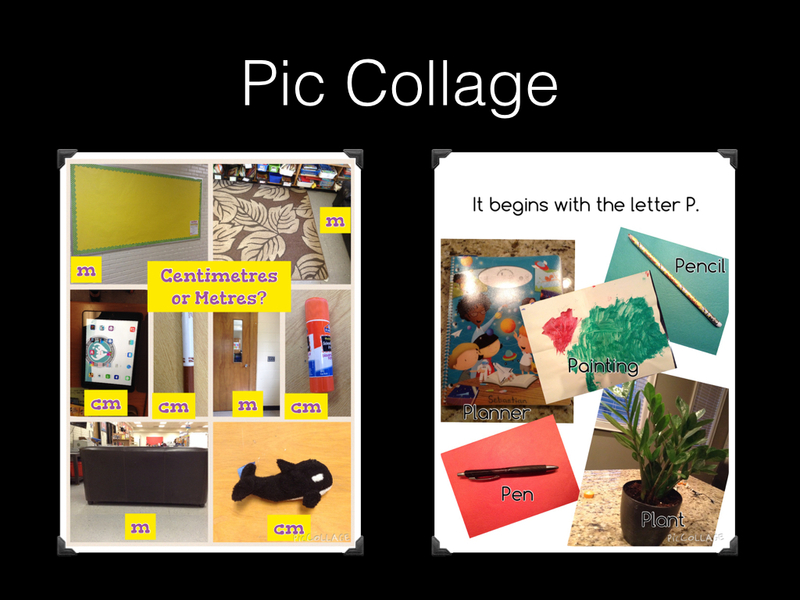 After the first initial lesson on "iPad Norms" A great app to start with is Pic Collage. 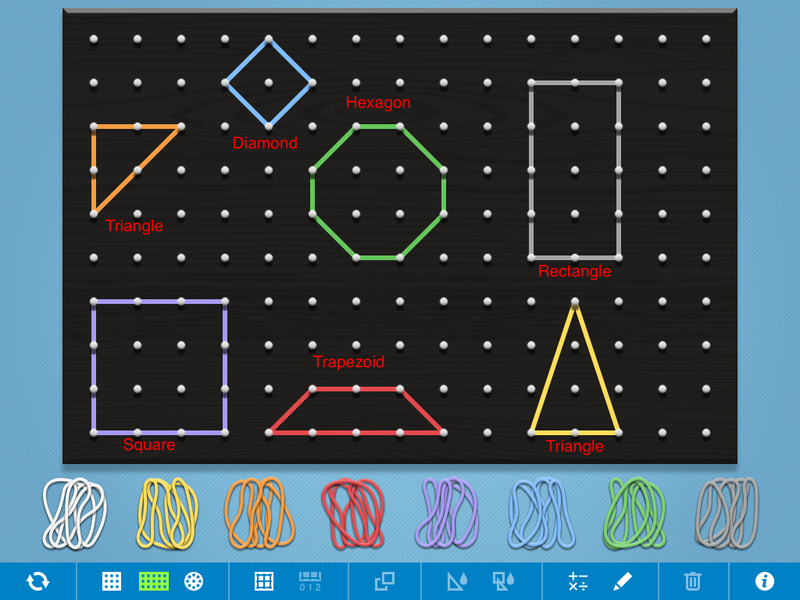 I really like this app because there are so many uses, very simple to use and it is free! Here are a few ideas on how to effectively use Pic Collage in your classroom. with a phone that plugs into the headphone jack in the iPad to reduce background noise. (I purchased them at the dollar store.) We then airdropped all of the pages to one iPad, combined the pages in Book Creator and exported it as a movie so the class could watch and listen to their class book on the big screen! The PBC is a community of primary teachers (K-4th grade) that want to share their students' learning via their classroom blog and their students' personal blogs. Classrooms will be grouped with 3 or 4 other classrooms from around the globe. The program is 5 weeks long. The first week will concentrate on the classroom blogs only. During this week, you will visit the other classes' class blog. This is a chance for the other classes to see what is happening in your school and class, to discover where in the world you are located and to learn about how to write a good blog post and to watch how you model and work together to write a good comment. 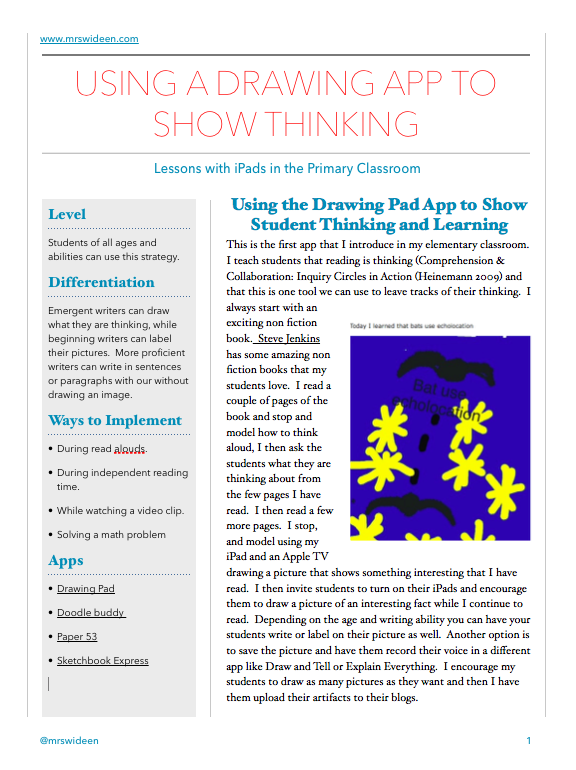 After the first week, we switch the focus from your classroom blog and concentrate on student blogs. The second week, one class will be the focus class with the other 3 classes commenting on the first class' individual blogs. The cycle continues for 3 more weeks. The focus is solely on your student's individual blogs. 2. PBC creates enthusiasm in reading and writing. 5. On some days in the last rotation, my students had over 100 comments on their blogs! The excitement and engagement piece to this blogging community is huge! What do I need to have to begin? You need to have a classroom blog (could be a blog that is part of Kidblogs, just to give the rest of the participants some information about your school and community) and your students need their own personal blogs. We also communicate frequently on twitter, use #PrimaryBC on twitter and follow me on twitter for news and updates @mrswideen. Please fill in the google doc here. I will be closing registration September 21st and we will begin October 5th. This past year, I really focused on explicitly teaching comprehension strategies to my students. I taught how to reread a text, annotate a text, leaving tracks of thinking while reading, questioning techniques and most importantly, instilling in my students that reading is thinking. We used Padlet walls to show our thinking, we drew pictures and wrote information digitally as I read aloud, we used today’s meet to make our thinking visible. Using these different strategies kept my students engaged and allowed their thinking to be seen by their peers and myself. Near the end of this past year we began an inquiry on Africa. I find one of the most challenging things about student inquiry is to find resources that are interesting and at my students reading level. One resource I use often is readinga-z. 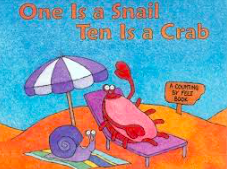 Reading a-z is a website that has more than 2,500 downloadable books (including English, Spanish, and French versions) and thousands of teaching and learning materials. 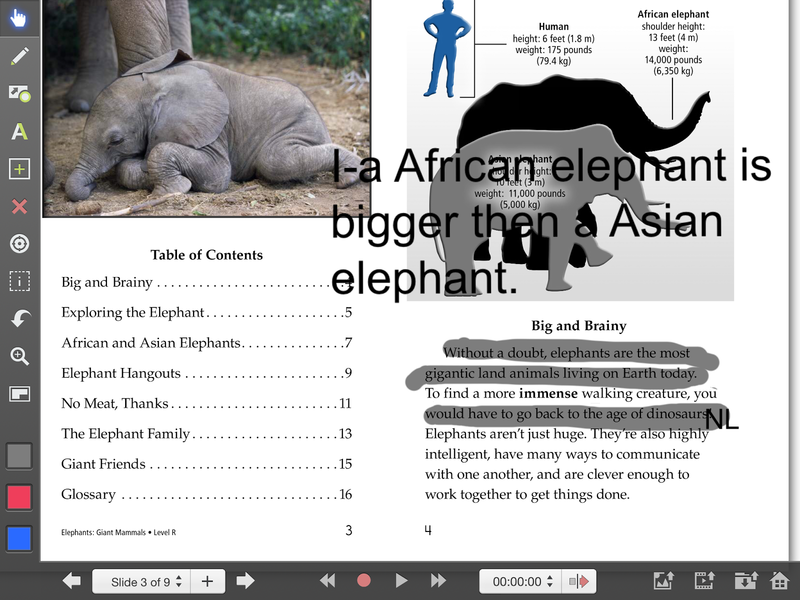 I use to search for specific topics and then match my students reading levels to the text. I would then print the various books out for my students. This took a lot of time to print and a lot of paper! I can usually find 2 or 3 different texts on the same topic in varying difficulty. The PDF opens in Explain Everything and now students can annotate, draw, highlight and record their voice right on the document. They can also save their work and go back to it for research purposes and it is a great way for me to assess their comprehension strategies. A few weeks ago, I did a workshop on Creating Authentic iPad Learning Stations for Primary Students. I thought I would share some of the things that I spoke about and some of the key points that I tried to get across in my workshop. First, an iPad Station does not consist of handing a child an iPad, putting them on an app and letting them click away. Come on people, aren’t we past this by now? In the past, I have had colleagues come ask me if they can use the iPads in my room the following period. When I replied yes, their next question was, “What apps do you have on them?” WHAT!? Integrating technology doesn’t mean that you hand a child an iPad for a period because you have nothing planned. Using technology needs to be purposeful. It needs to be thought out, and there needs to a reason to use it. Technology is used to give students a voice, give students choice, to give students a global audience, to make thinking visible and to allow me to assess and give feedback using voice and video. It also enables my parents to see their children’s work on a daily basis through Twitter and their personal blogs. 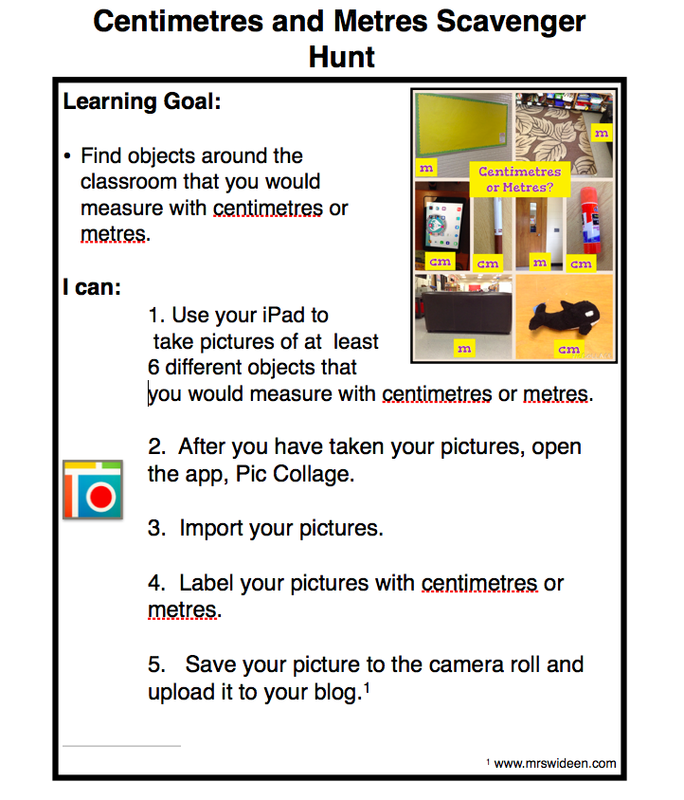 When I first started creating my iPad task cards, I only had 2 iPads in my classroom. I originally used them as a centre or station during my daily 5 or my math stations. 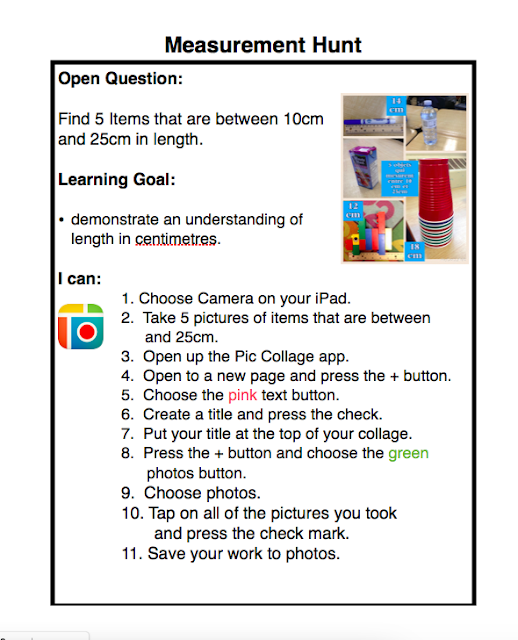 I was able to put the task card along with an iPad and voila! 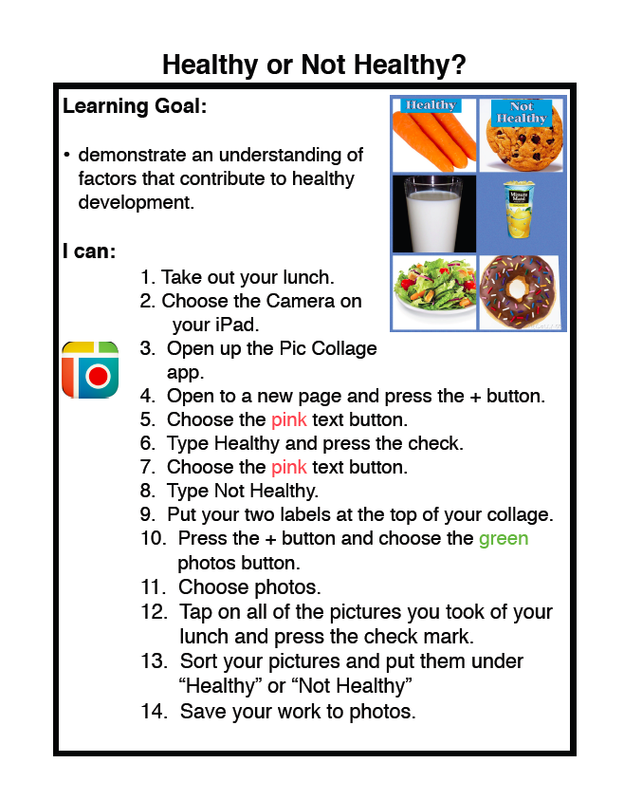 My students were able to all have a turn using the iPad for something meaningful. All of my iPad stations stem from the Ontario Curriculum. Now that I have a cart of iPads, I still use the iPad stations but, now many of the task cards are made for whole class activities and are step by step instructions for students to follow to complete a task. 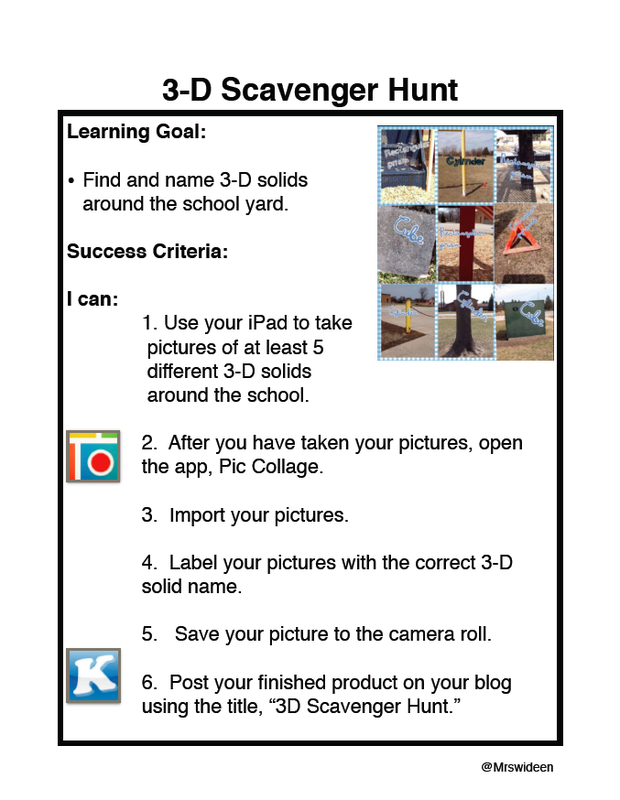 My second key point is that you only need one page of apps for your students to be successful. I too, have fallen into the free app downloading frenzy. What happens is you have so many apps for your students to use that they never get comfortable using it and then have to spend extra time learning the functions rather than concentrating on their work. 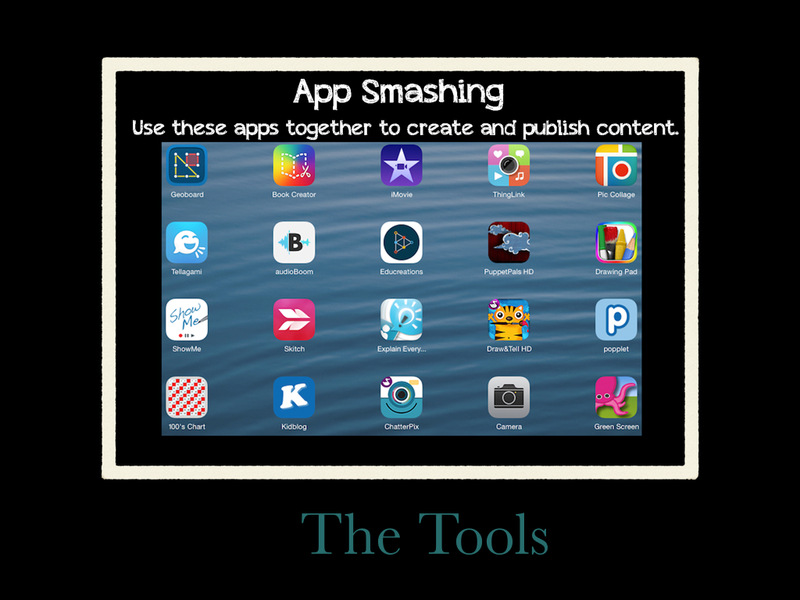 If you have a handful of apps that your students can use efficiently then they are not distracted by trying out a bunch of new apps that probably aren’t as good as the ones I am going to suggest anyways. I like to use apps that you can use for different purposes. We use two whiteboard apps in my room. For young children or children new to the iPad, Draw and Tell is where to start. For experienced iPad users (which is most children) or children in grade 2 or higher I strongly suggest Explain Everything. If you can only buy one app for your iPads, make it EE. 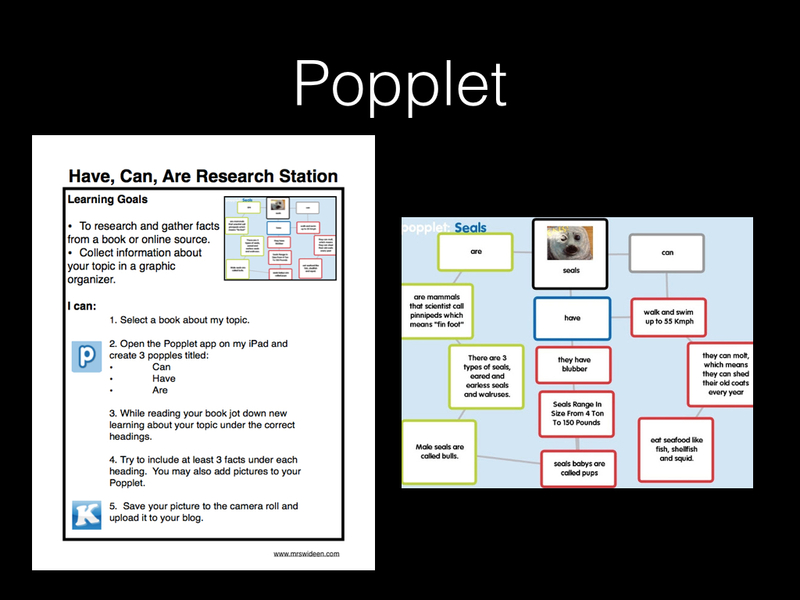 This year, I have used Padlet walls to assess work. Some of my students choose to use paper and pencil instead of the iPads to show their learning, with a quick picture of their work they can upload it to the Padlet wall and I can look at all of my students' work in one place from anywhere and see who is ready to move on or who needs to work with me the following day in a small group. 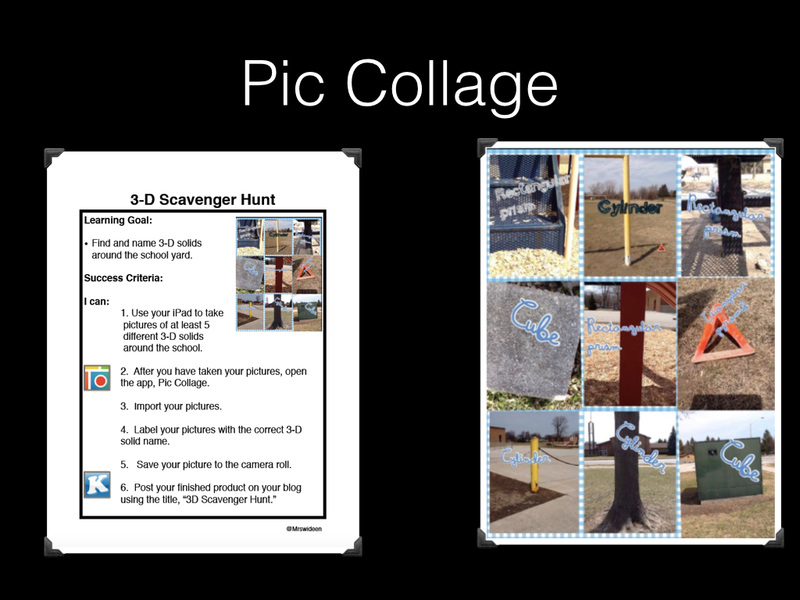 These are only a few examples of the iPad stations we use, please feel free to use any of the stations I have created. You can download and print them for free. At the top of the page where it says iPad Stations is where they are all stored. Enjoy! 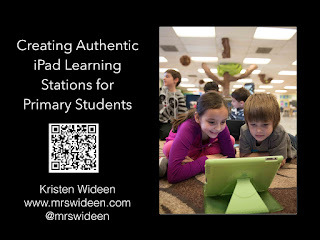 I have many emails from teachers that are just starting to use iPads in their classrooms about what apps I would recommend. I have to admit that the apps I loved 3 years ago are the pretty much the same ones I would recommend today. I do need to stress that these apps alone without teacher direction and curriculum goals will not magically improve your test scores or your students writing levels. 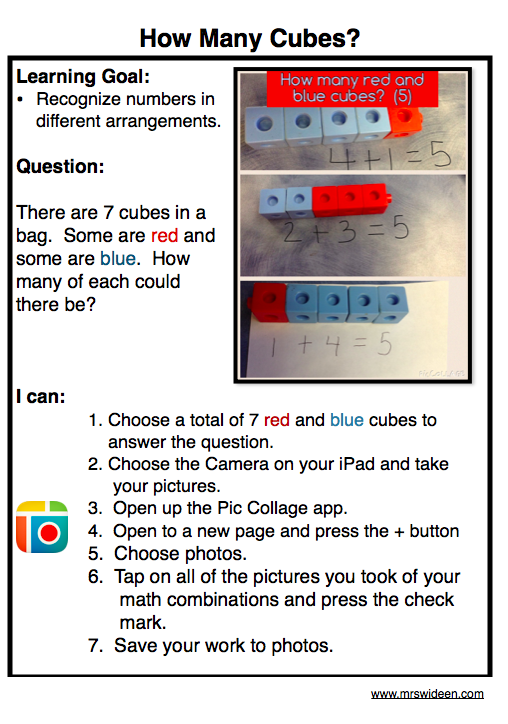 There is a lot of thought in the way that I incorporate technology into my classroom. My favourite apps aren't button pushing apps that help students memorize math facts or sight words. 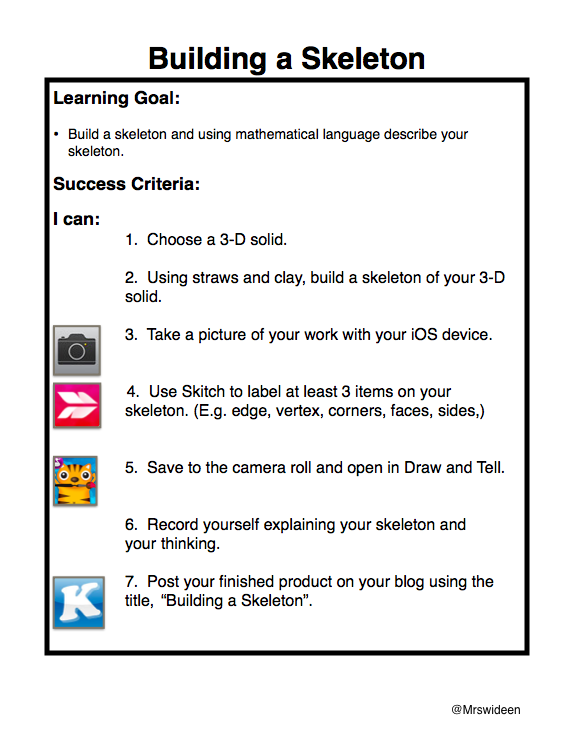 These are apps that if used properly show student thinking. 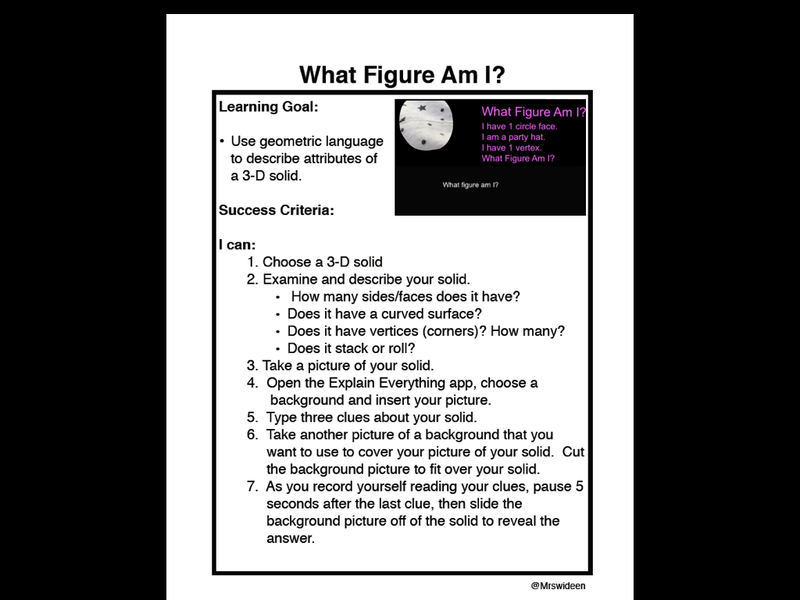 They are apps that make assessing students knowledge and thinking very apparent. These are apps that allow my students freedom and creativity to show what they know. So my disclaimer is that these are my favourite apps for my classroom. A classroom that offers a lot of choice and freedom to my students. A classroom that is noisy, messy and full of life. This may not be your kind of classroom. These may not be your kind of apps. 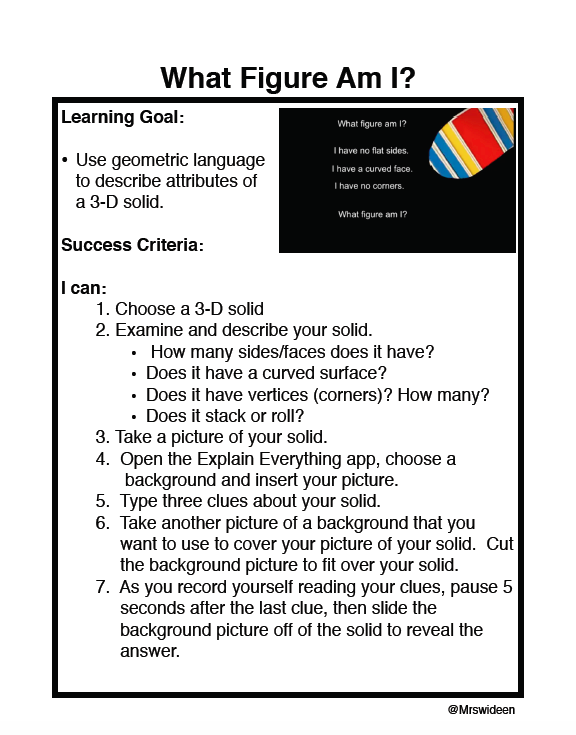 As I am wrapping up my geometry unit, I wanted to share some of my favourite activities I created for my kids to show their thinking. 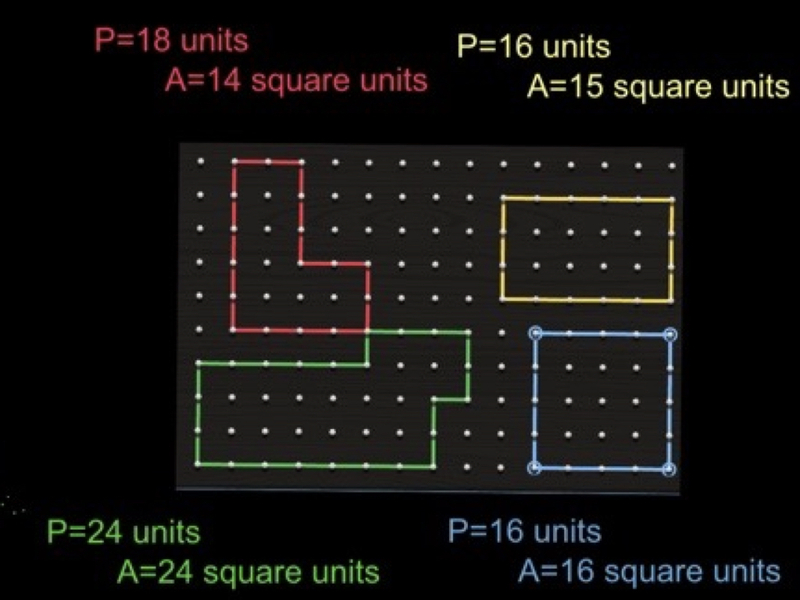 When I told them that we were starting a new unit next week they were upset because they had so much fun learning and showing their thinking during this unit. 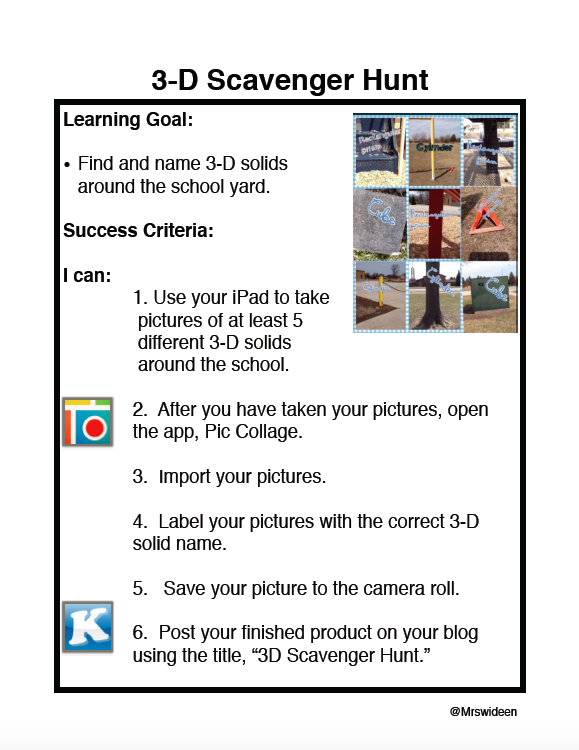 I hope you can find some of the following activities useful and fun! 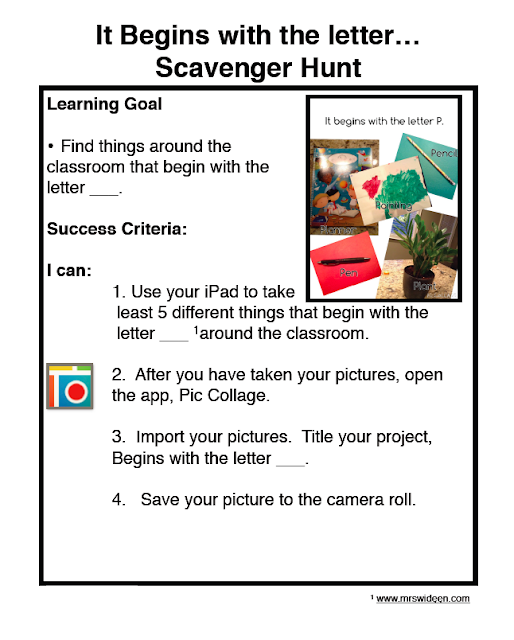 Upload this task card here. 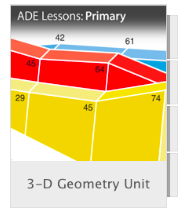 If you are interested in more activities, download my free iTunesU course on 3D Geometry here.